Our Manufacturer makes hundreds of premium leather products so quality, durability, and softness is assured. The Cruiser is one of these premium leather products. 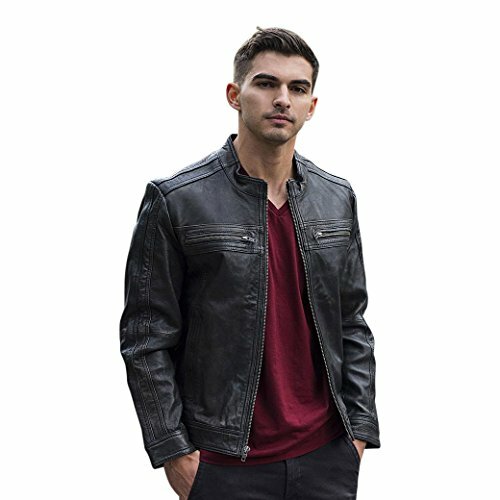 A Leather Jacket for men that will have you feeling and looking good. The Distressed Lambskin leather is a soft style that everyone will love! This type of leather is soft and supple against the skin. This lightweight and finely grained leather is well known for its soft texture. It's this buttery smooth feeling that sets it apart from other luxury leathers like caviar, which have a rougher texture in comparison. You will never regret buying a product from us! We have all the Sizes Available in a Classic Black. Our Premium Cruiser Leather Jacket is of the highest quality (real) leather. Our Cruiser Jacket comes in Classic Black. The Cruiser comes with a classic center zip cafe style jacket with stripe panel detail across the chest and down the back with two zippered chest pockets, two front pockets, and one interior snap pocket. The Cruiser is a Lightweight Distressed Lambskin Leather that has a Mandarin collar and a zip & snap sleeve that is fully lined. This type of leather is soft and supple against the skin. This lightweight and finely grained leather is well known for its soft texture. It's this buttery smooth feeling that sets it apart from other luxury leathers like caviar. We use the best quality leather, anywhere in the world, so we have a Lifetime Warranty! Multiple Sizes Available! Color-Classic Black. If you have any questions about this product by Whet Blu, contact us by completing and submitting the form below. If you are looking for a specif part number, please include it with your message.